Submissions for this initiative will be accepted starting February 5th to February 29th. Top finalists will be announced on March 5th. Voting will take place from March 7th to March 11th. Winner will be announced on March 15th. Publicly post a photo or video to TIDAL’s Facebook wall or on your Instagram of you completing any type of community service. - In your post, you must also include your school name and use the designated hashtag #TIDALXChange. - Bonus: tag a friend in your school to nominate them to participate in the Social Wave for Change. Don’t forget to tag all submissions with the hashtag #TIDALXChange ! CAN I SUBMIT MULTIPLE POSTS? Students may submit multiple acts of service that all may differ in cause and impact. All submission posts must be an original photo and must follow all criteria above to be an eligible submission. A panel of judges, selected by TIDAL, will review all of the social media submissions and will narrow them down to a select group of finalists. These finalists are picked based off of their involvement in TIDAL College’s Social Wave for Change. Finalists will be students and/or student organizations that positively demonstrated an impactful Social Wave for Change in their college’s community. Once finalists are selected and announced, the public will vote on the winner. Voting will be open to anyone in the U.S. who is 18+. Finalists are encouraged to drive friends, family, and students to vote as well as share the link. 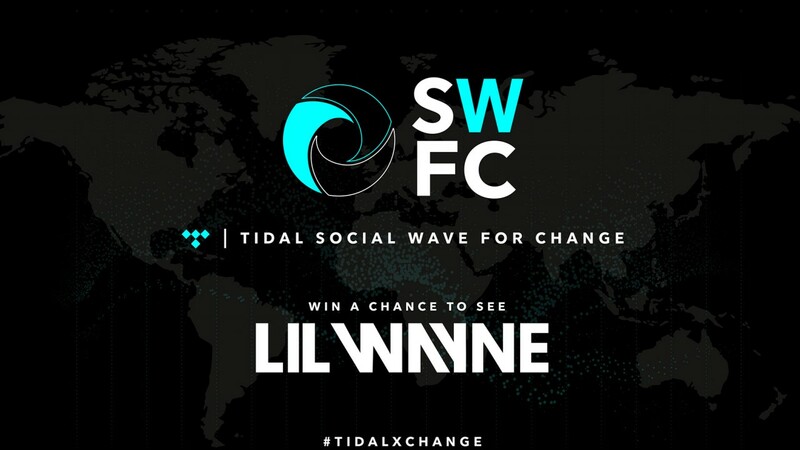 The finalist with the most votes at the end of the voting period will win a free Lil Wayne concert near their school! For details, see rules here. Finalist will receive a silent disco event at their school. Winner will receive a Lil Wayne concert near their school.